At summer Namm show 2004 Roland announced the addition of the HPi-7 new digital piano to its acclaimed HPi-Series. Launched at the European market earlier in 2004, the HPi-7 combines acoustic piano touch and sound with Roland's digital features for music education. It features built-in accompaniment options, colorful screens, personal tutors and DigiScore notation displayed right on the music rest..
Powered by a new engine the HPi-7 offers a new Visual Lesson feature that acts as a personal interactive music tutor. Three new Visual Lesson courses include independent exercises, 10 songs with variable levels, and Practice, Check and Review Screens. The Visual Lesson feature also works with all internal songs, as well as Standard MIDI files. 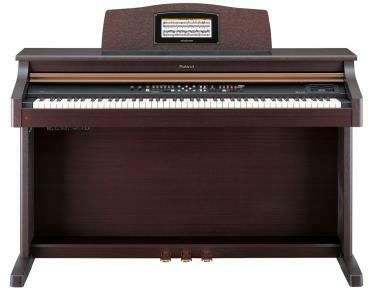 The HPi-7 also offers a refined cabinet design, piano key lid and expanded Demo Function. The Edit function allows busy teachers to automatically add optional finger numbering directly into the notation, change the length of a song, or edit any note in the music files with a touch of a button. Each individual music file notation can be saved as a bitmap file, which teachers can then print out using their PC. The HPi-7 also comes equipped with a USB port for easy expandability. © 1997 © 2010 Pro-Music-News. All rights reserved. Thank you for visiting Pro-Music-News.